Pellerin Milnor Corporation is pleased to announce the new paint color scheme for PBW™/CBW® systems equipment—Azure Blue (RAL 5009) and Silk Grey (RAL 7044). These two paint colors replace the previous color scheme of Triton Blue and Warm/Phantom Gray. Like the previous paints, the new powder-coat paints will have anti-microbial agents added to promote hygienic laundry environments. Milnor chose the new paint colors to comply with RAL, an international standard of paint colors. All electrical components for the entire Milnor product line will be painted Silk Grey. And, all tunnels, extraction devices, pass-through dryers, and material handling equipment will be painted Azure Blue. Special orders for alternative paint colors are available for an additional cost. 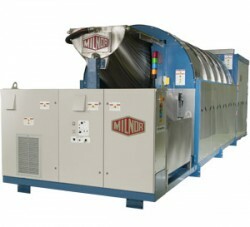 For more information, please email milnorinfo@milnor.com, contact your nearest Milnor dealer, or call 504-712-7656.